Baking Sponge Cakes [Cakes without Fat]: A practical test for the temperature of the oven is the placing of a bit of flour or white paper in the oven. If at the end of 5 minutes the paper or flour is slightly browned, the oven is of proper temperature for sponge cakes or cakes without fat. Baking Layer and Loaf Cakes: If a bit of flour or white paper is delicately browned after being placed for 2 minutes in the oven, the oven is of proper temperature for layer cakes containing fat. For a loaf cake the oven should be cooler, since a longer time for baking is required. It is especially important that a crust does not form over the top of a cake before the cake has risen, or before it has been in the oven one-fourth of the time required. Your slice of cake looks so delectable! Good info to know about oven temps. The picture is a photo of a yummy cake that I made earlier this year. 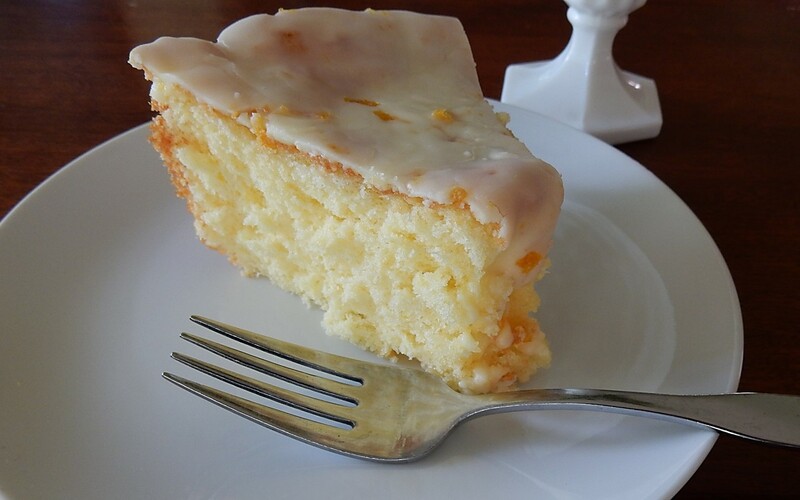 It is Sunshine Cake with Orange Frosting. In the days when I was lucky enough to have an Aga, I used to do that! Wow, it’s cool to hear that you used this method. It’s amazing what we so easily take for granted. There are reasons to appreciate the values of “the old days,” but I certainly appreciate the technologies of today. It’s interesting how in the days before modern technology, there were little tricks that people used that have been long forgotten. Cooking was really a hard skill to learn back in those days. I agree! My sense is that cakes and cookies were less popular back then than what they are now, in part because they were difficult to make. No 🙂 I wish that I had a wood stove. It sounds perfect for butchering. Fascinating…I suppose it’s a helpful trick also if your modern oven temp seems off. Do we really appreciate how much easier cooking is today? Or how much may have been lost? So interesting. Thanks. It’s amazing how much much cooking processes and methods have changed over the last past hundred years. I have a wood stove. Luckily it has a thermostat, but this is still great info. Thanks. Sometimes I wish that I had a wood stove. If I had one, I could make the old recipes using a more authentic process. hmm. . . Now that you have me thinking about it, I would have guessed that sponge cakes contained butter. This is so clever. I admire the ways they used to get the best results of baking and cooking. I love these types of simple and practical hints and tips from days gone by. Interesting and that cake looks melt-in-your-mouth delicious! I often struggle to take photos that turn out the way I want them to, and it’s nice to hear you liked this picture. Taking pictures of food is the hardest part of a food blogging. Learning how to stage a shot takes some real practice. I pick up cookbooks at thrift stores with large glossy pictures for ideas. I also look for dishes that are unusual shaped at thrift stores. It also helps to get someone to look at the pictures and pick one they like. I’m glad I have an oven with a thermostat. Still, if you were used to iffy heat, you’d know how to manage it. I enjoyed reading about it. I agree. 🙂 I’m also glad that my oven has a thermostat. Interesting trick. I wonder if it would work with apartment ovens, which are notoriously difficult to trust temperature wise. hmm. . . maybe. . .
How resourceful! Those ladies were smart. It’s fascinating how people were able to “measure” the temperature without a thermometer or gauge.